It turns out that, as well as being pretty good, Pillars of Eternity is pretty popular too. We can measure popularity by the amount of people who like a thing, and it appears that no less than half-a-million people like Pillars of Eternity enough to actually buy it. The game has shifted 500,000 copies since it released in March. The 500,000 milestone includes copies sold as Kickstarter rewards, and sales of the full game on the likes of Steam and GOG.com. It’s a number that makes developer Obsidian and publisher Paradox very happy. Already finished everything in Pillars of Eternity? Try one of our picks of the best RPGs on PC to feed your roleplaying hunger. “Pillars of Eternity has been a life-changing experience for me, and for everyone involved in its creation. Knowing that over half a million people have gotten to share in that is both flattering and humbling. I want to deeply thank all of our fans and supporters. We can’t wait to share what we’ve got next for the world of Eora,” said Obsidian CEO Feargus Urquhart. 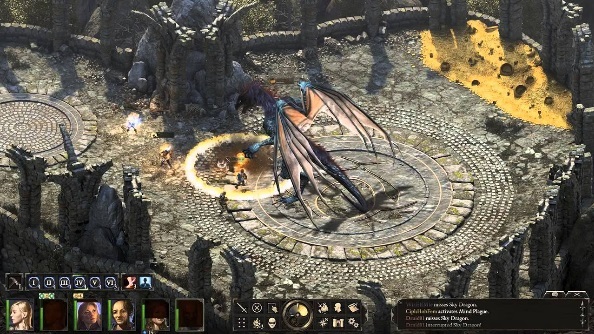 Obsidian intend to grow their original setting of Eora across other products, similar to how the Dungeons and Dragons setting expanded over books, TV, and computer games. Pillars of Eternity will not only see further expansion with The White Marchpart 2, but will also have its own tabletop card game in the form of Lords of the Eastern Reach in 2016, and a variety of eBooks written by the game’s core writing team. Expect to see stories from Carrie Patel, Eric Fenstermaker, and Paul Kirsch in the future.